The Gentle Leader Head Collar adds a nice cushion to the top of the leader to make wearing it more comfortable to your dog. This training collar fits securely around the snout of your dog and provides you with a better control than you would find with a choke collar or spike collar. Dogs that are headstrong will find this to be an effective deterrent. Essentially, exerting control with this device will turn the dog’s head toward you. Combined with treats or praise, this directs your dog’s attention away from the distracting object and focuses its attention on you. The collar comes with a DVD instruction manual on how to put the harness on and training procedures to help your dog get used to having it on. In a short time, they will be pawing at the Collar to be taken out. 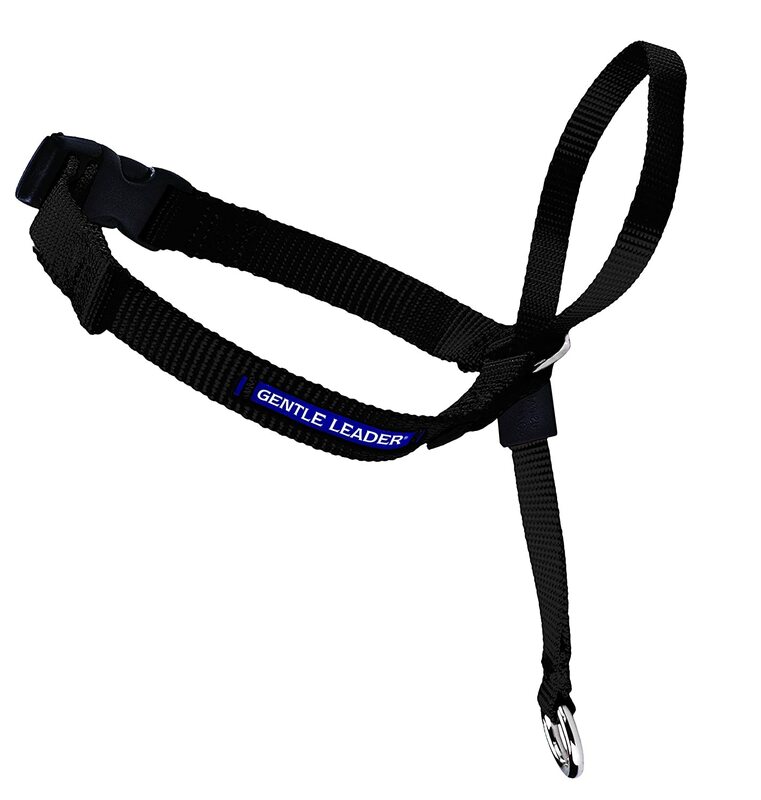 The Gentle Leader Easy Walk Harness is designed to gently discourage your dog from pulling while walking on a leash. This means more of you walking your dog and less of your dog walking you. 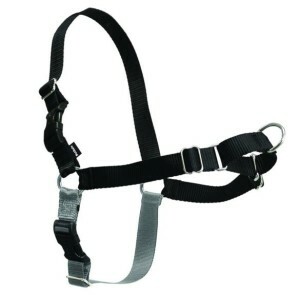 Unlike traditional collars, the Gentle Leader Easy Walk Harness never causes coughing, gagging, or choking because the chest strap rests low across the breastbone, not on the delicate tracheal area. The strong nylon is both soft and adjustable in four places for maximum fit and comfort. There is a quick snap buckle on both the shoulder and belly straps, plus a complementary color for the belly strap, making the harness easy to put on and take off. It’s easy to fit and easy to use, that’s why they call it Easy Walk! Pet Expertise was the first to offer you The MannersMinder AKA Manners Minder Remote Reward Dog Training System from Premier and we continue to have the lowest price, low shipping and a FREE exclusive crate training guide! Reward your dog’s good behavior instantly by remote control. Reward your dog even while you are out of sight (up to 100 ft away, even through walls!). Automatically feed a treat every few seconds or minutes – this is the ultimate tool to help teach dogs to be alone, crate trained and a great help for grooming! Train obedience commands such as “down”, “stay”, “sit” and “come”. Train your dog to be calm when guests arrive, to stop jumping up or barking at guests. Crate train your dog or teach your dog to be calm when alone. Pet Expertise note: The MannersMinder is great for preventing and working with mild separation anxiety. Train your dog to lay down politely instead of begging at the table. Train your dog to calmly accept grooming such as nail trimming and brushing. Train agility and tricks which are fun and great for tiring out hyper or energetic dogs. A hand-held remote that can operate on 4 separate channels. The remote control runs on an included 23A-12V battery and works from a distance of up to 100 ft – even through walls! A target training wand with detachable base to teach tricks, heeling, and “go to your bed”. Two treat dispenser disks for different sized kibble and treats. The MannerMinder’s dog-proof housing measures 13.5″ x 7″ x 8″, and weighs 3.5 lbs. It will run for approximately six months on 4 D batteries (not included). One year manufacturer’s warranty. Complete instructions for use including an illustrated training manual and DVD. Plus a free exclusive guide to crate training written by Pet Expertise’s owner, Jess Rollins! 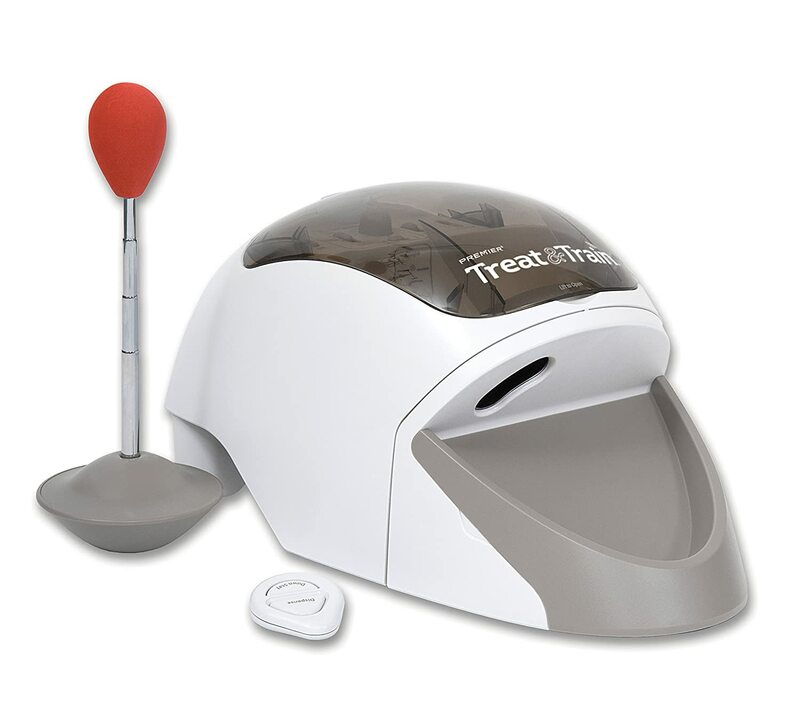 The Manners Minder remotely dispenses kibble, dry dog food, or treats of uniform small sizes. Most dogs will readily learn to earn their meals (And it’s great for them!) Professional dog trainers have long understood the advantages of using your dogs regular meals for training.